On-board Features Bluetooth V4.1, Asus Wi-Fi GO! (Wi-Fi 802.11), Asus UEFI Bios. General Info Asus Prime X299-Deluxe motherboard. Supports Core X-series CPUs, up to 8.0 GT/s system bus. Also supported high speed 2666MHz DDR4 Ram. Arranged as high performance Quad channel. Ram overclock up to 4000MHz. 8x 6Gb/s SATA Ports with Raid 0,1,5,10. 2x Gigabit LAN port, Supports Nvidia Quad-GPU SLI & AMD 3-Way GPU CrossfireX technology. 2x M.2 Sockets, Optane Memory support via M.2. Additional CPU / System cooling options plus Speaker options available in the 'System Option' pull down. 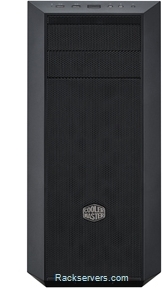 Description Cooler Master Mid Tower MasterBox 5 (MCY-B5S1) PC ATX chassis providing 2x 5.25" External bays (1x 5.25" External & 1x 3.5" Card Reader), plus 2x Internal 3.5" HD/SSD bays and 2x Internal 2.5" SSD bays. Advanced cooling (and support for CPU liquid cooling). System supplied with 1x 140mm Front & 1x 120mm Rear, with optional fan upgrades to 1x 120mm/140mm Top, 2nd 120mm/140mm front, see options in the 'System Option' pull down. 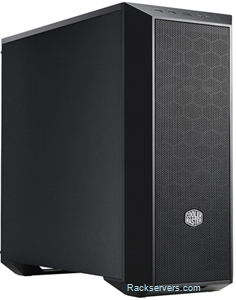 High efficiency PSU options from 650W to 1300W.